From the laboratory of the Wizard of Menlo Park [Thomas Edison] there is coming an invention which out-Edisons Edison. It is the marriage of the phonograph with the camera . . . The new wonder will be called the “Kinetograph” . . . strange sounding to the ear to-day, but destined perhaps soon to become as familiar as locomotive or telephone . . . [as] Mr. Edison . . . knows that its base principle is right all that remains to be done is to perfect the details . . . the machine is, in fact, merely a mechanical eye. In fact, the Wizard discovered that perfecting the details would take longer than he had anticipated, and many other inventors were working on the moving picture idea in the US and elsewhere. Edison went ahead and produced the kinetoscope, a silent moving picture device, while he and his lab continued to work, off and on, on a way to combine images with sound. A kinetoscope was not a movie projector – it was a private show for one person at a time, looking through a peephole. The image was produced by a strip of film bearing sequential images over a light source, with a high-speed shutter. In the spring of 1892, the lab began to make a nickel coin slot part of the kinetoscope. It received its patent in March 1893. Edison first demonstrated the kinetoscope in public in May, and it became popular in the United States and in Europe. 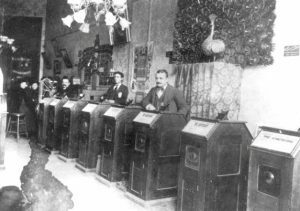 The first kinetoscope parlor opened in New York City in April 1894 and became the first commercial motion picture house. It had ten machines, each showing a different film. For a quarter, you could watch all the films in a five-machine row. The first ten films in the first program (made by Edison) featured a barbershop scene, blacksmiths, a contortionist, Highland dancing, wrestling, and so on. Each film was very brief (less than a minute), and watching five of them was comparatively expensive – for 25 cents you could get a ticket to a major vaudeville show. Still, the new technology was very popular and kinetoscope parlors proliferated. Don’t fail to see Edison’s latest invention the kinetoscope. It will be on exhibition at Foster Bro’s bookstore, 24 Seneca St. . . . There are four scenes, each . . . an act such as a barber shop episode, shooting glass balls, a wrestling match, and London gaiety girls in skirt dancing, with lifelike fidelity. A nominal charge of 5 cts for a view through each kinetoscope. The tide, however, was running against Edison and the kinetoscope. The first, and most successful, projector was the cinematograph, invented by Leon Bouly of France in 1892. He sold it and the name to August and Louis Lumiere, and in 1895 they gave the name to a device that they had improved substantially. The cinematograph was both a motion picture camera and projector. In December 1895 the Lumieres organized the first commercial screening of a cinematographic film. They had produced ten short films, each running for about 50 seconds, including a sequence of their workers leaving the Lumiere factory. The cinematograph became popular worldwide, and was used in nickelodeons (inexpensive movie theaters), fairs, and vaudeville houses. Projected motion pictures became increasingly popular in 1895, and the kinetoscope was losing business to the Mutoscope (a peepshow device that worked much like a flip book). Edison finally looked into a projection system. Charles Francis Jenkins and Thomas Armat had worked on Jenkins’s Phantoscope, which Jenkins had used for the first documented projection of a filmed movie in June 1894. The two inventors parted ways and the device eventually came to the Edison Company. 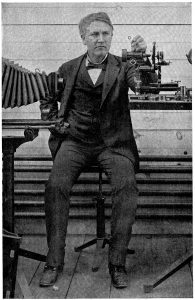 Edison agreed to produce the Phantoscope and films for it, if it was advertised as a new Edison invention named the Vitascope. Many of these devices were mentioned locally, but by 1898 it seems that the particular projector was becoming less of a concern. On December 17, the Daily Times used the simple headline “Moving Pictures.” After 1900, it was more and more common for Genevans to see and read about moving pictures, life motion pictures, and motion pictures, without any reference to the projector. By 1907, Geneva had a theater – “A sort of Dreamland show will shortly open on Exchange street . . . Oh, we’re fast creeping up to a city of the first class!” (Advertiser-Gazette, January 10.) By 1913, we were calling them movies.